NOIR Episode 6: Where Are All the Gun Celebs? 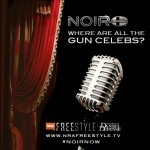 The latest Episode of NRA Freestyle’s NOIR is now available below to watch online. Check back weekly right here on the GunLink Blog for new episodes or tune in live every Sunday night at nrafreestyle.tv.